Hosting the Perfect Dinner Party - What Could Go Wrong? A perfect dinner party leaves every host with a feeling of satisfying accomplishment. The ultimate goal is hosting an evening enjoyed by all who attend. When this is achieved, you'll know you've done your job superbly. But in reaching for the goal of the ideal dinner party, it's easy to consider only perfection. The invitation and RSVP process is seamless. You arrange a designer-quality table. The menu is planned with guests' preferences in mind. Guests arrive in a timely manner, coats and bags find their space, drinks are in hand, and mingling begins. 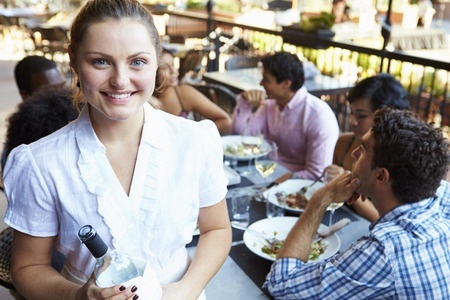 Your planned food service is perfectly executed and everyone loves it. Delightful conversation is enjoyed all around. Guests' needs are met throughout the dinner (extra helpings, another glass of wine, etc.). Guests are clear on your expectations (clearing the table, coffee served in another room, etc.). The evening ends at a reasonable time. You look forward to your next party! The other half of perfect involves the guests. After all, you're not giving a party for yourself. The kind of guest who is invited back . . . Provides a timely RSVP to your invitation. Has an understanding of table manners. Reveals allergies and strong preferences in ample time. Enjoys the food and company. Expresses gratitude for the lovely evening. Is mindful of an appropriate departure time. Follows up with a thank-you note. If Only Parties Were Really This Perfect . . .
Now that we have the ideals listed, let's explore the real world of dinner parties. Because unfortunately, you must admit, no human situation is ever perfect. Another unfortunate aspect is that you can never build in the unforeseen - there will always be uncertainty. But when things do go wrong, you have an opportunity to shine. 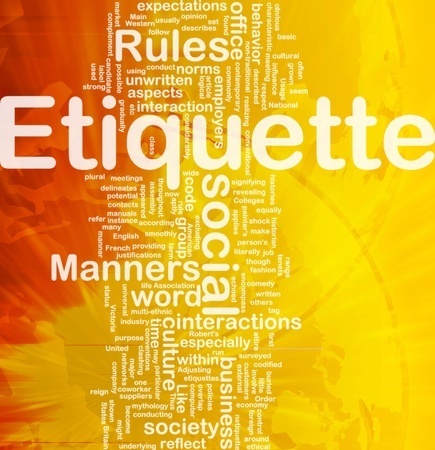 Etiquette to the rescue! Default to kindness and courtesy with a positive attitude and problem-solving mentality. Pause, breathe, think, be mindful. You forgot the place cards. To keep your guests from milling around the table in confusion at this point, take charge by verbally suggesting seat assignments. The salad you served needed a knife and you forgot to include salad knives at the place settings. Just as the server begins picking up the salad plates and knives, a diner realizes she will soon need another knife, and saving her knife to use again, the messy used one soils the table cloth. A best response? Announce: “I need to get you all dinner knives!” This may mean that you now scramble to wash all the knives just picked up if you don't have extras. But think of it as an opportunity for others to extend the table conversation in the dining room. A guest gets more than a little loopy and is laughing boisterously. You can silently refrain from refilling the wine glasses. And you can help change the subject by adding a new conversation topic. The soup you prepared tastes awful. You used a difficult recipe, successfully attempted once before, but this time it is a failure. Admit the mistake to your guests with a humble apology. Avoid a defeatist attitude and let the recognition of the mistake suffice. Proceed with the main course as if nothing had happened. An argument over politics arises at the table. Assert yourself. “Let’s call this a draw for now. Our digestive systems will keep us up all night!” Insert a conversation topic that is interesting, but moves people away from the doldrums. A special guest from out of town takes out her cell phone and silently begins texting during a lull in the conversation. What to do? Nothing. As a host you may consider adding a ‘note to yourself’ for your next dinner party to solve for the problem before it happens. 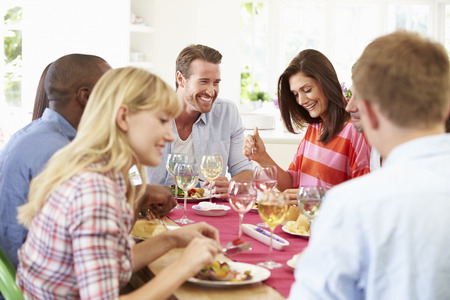 After your dinner party, consider everything that went right, including that your guests were glad they came. Regardless of what went wrong and how you reacted to it, there are always lessons to learn from the mistakes. Things that couldn't have been anticipated don't need attention. Include dining utensils appropriate to the menu and the diner’s needs. Choose menu items that probably won't go wrong. Have a heart-to-heart chat with your uncle who brought his guest uninvited. Or decide that you should let it slide. Consider talking with your friend about his imbibing too much or perhaps reconsider inviting him to your next dinner party. Note mistakes that may be solved by tweaking your preparation system. This may even include brief mention of the 'of course no cell phones at the table’ rule at the beginning of dinner. Who knows what your lessons learned will be! But there's one thing for sure: don’t worry about it. The best rule of thumb is to have another party!